Amy Smart at the Herve Leger By Max Azria Fall 2008 fashion show during the Mercedes-Benz Fashion Week Fall 2008. Amy Smart at the Reebok "Freestyle World Tour" event. Amy Smart at the Rodeo Drive walk of style awards ceremony. 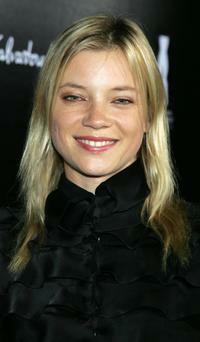 Amy Smart at the premiere of "Notes On A Scandal." Amy Smart at the CBS 2006 Summer TCA Party. Amy Smart at the 2007 Vanity Fair Oscar Party. Amy Smart at the "Bloodline" Photo exibit. Amy Smart at the BCBG fahion show after party during the Mercedes-Benz Fashion Week Fall 2008. Amy Smart at the Cynthia Rowley Fall 2008 fashion show during the Mercedes-Benz Fashion Week Fall 2008. Amy Smart at the Rebecca Taylor Fall 2008 fashion show during the Mercedes-Benz Fashion Week Fall 2008. Amy Smart at the premiere of "Resident Evil: Extinction." Amy Smart at the 21st Genesis Awards. Amy Smart at the CBS Upfront Presentation. Amy Smart at the J Mendel Fall 2008 fashion show during the Mercedes-Benz Fashion Week Fall 2008. Amy Smart at the "Heaven: Celebrating 10 Years" event benefiting the Art Elysium. Amy Smart at the Max Azria 2008 fashion show during the Mercedes-Benz Fashion Week Fall 2008. Amy Smart at the Helio launch summer party of "Ocean" to benefit Heal the Bay. Amy Smart at the Best Friends Animal Society's annual fund-raiser, "The Lint Roller Party." Jason Statham as Chev Chelios and Amy Smart as Eve in "Crank 2: High Voltage." Amy Smart at the Monique Lhuillier Fall 2008 fashion show during the Mercedes-Benz Fashion Week Fall 2008. Amy Smart at the launch of the Pink Taco. Amy Smart at the California premiere of "The Single Moms Club."